New Zealand Residential Sales are continuing their trend with more properties sold when comparing the same period this year to last. August saw 6,548 houses sold nationally, which is up 8.5% on August 2012. As a group the NZ Realtors Network sold 13% more properties in August 2013 in comparison to the same month last year. As we enter into the Spring market, seasonally, we would expect listing volumes to rise as the weather starts to warm up and the daylight hours get longer. This may be tempered this year as potential sellers take a more cautious approach to putting their properties on the market. Many first home buyers are working to secure their lending before the Reserve Bank’s new lending policy comes into force on 1 October 2013 which is adding to the sellers market we have currently in. This is an ideal time for you to start marketing your property for sale as others take the cautious option of wait and see you will be able to take advantage of the slower listing volume and high buyer demand. 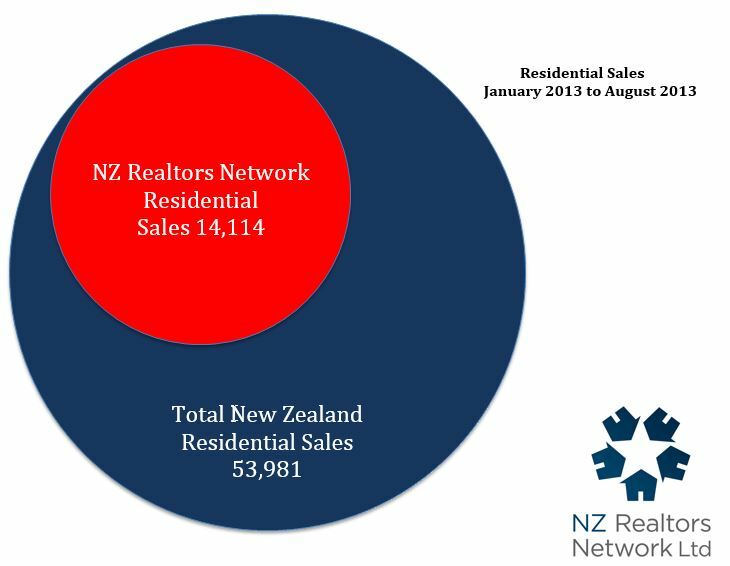 The NZ Realtors Network sell 1 in every 4 residential properties in New Zealand. We are the largest group of independently owned and operated real estate agencies spread throughout the country. Our expert local knowledge is backed up by our established nationwide referral network. This allows us to put you in touch with the local expert around the country. We welcome opportunities to represent clients at all levels throughout New Zealand. The New Zealand Realtors Network does not warrant or assume any legal liability or responsibility for the accuracy, completeness, or usefulness of any statistical information published herein. This information has been supplied by individual members from the New Zealand Realtors Network without verification by any independent party. The views and opinions of authors expressed herein do not necessarily state or reflect those of the New Zealand Realtors Network or any other parties.